Sorry. I kept meaning to blog, honest. Part of it is that I’m taking Wendee’s writing class and I felt very bad about blogging when I hadn’t had time yet to do my first assignment (Wendee, I promise, that will change tomorrow…I finally have time to spend my half hour in what pitiful little bit of nature I have in my own backyard). I also got to buy a Ranger Rick magazine for my second assignment….I don’t know how many of you remember reading it as a child, but I can tell you that it was pretty integral in my wildlife education (parents who care about it enough to subscribe to Ranger Rick for me didn’t hurt either). So…I have pictures for you, finally:)….yesterday was our office Thanksgiving party and, as is our custom, we all brought different parts of the traditional Thanksgiving meal, and our boss provided the turkey. 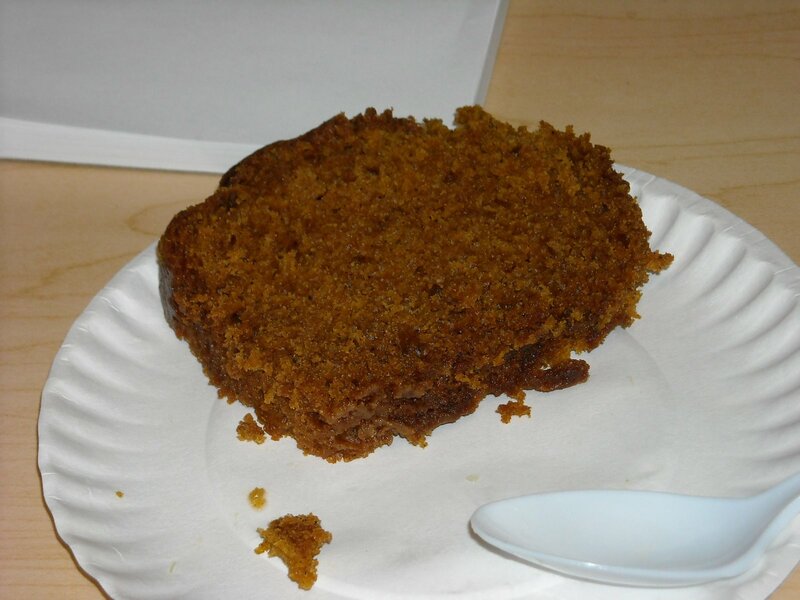 My friend Anne brought pumpkin bread for breakfast that was made by a “breadsmith” (I didn’t know they were called that) that’s nearby in SC. The bread was so moist and tasty…I forgot to take the pic before I ate the fruit that she brought also. And after a pretty humble blessing by yours truly, we got to the important part….the EATING!! It’s nice to work with an office of people with whom I can feel like myself; it hasn’t always been that way, and despite my inability to deal with the stress of the actual job at times, I have always very grateful when I look around my office and see people who work together to get things done. We might be a little rough around the edges (at least, I know I am when I get the looks of dismay for talking about poop (could be worse, I could be talking about boogers. )), but we’re family. 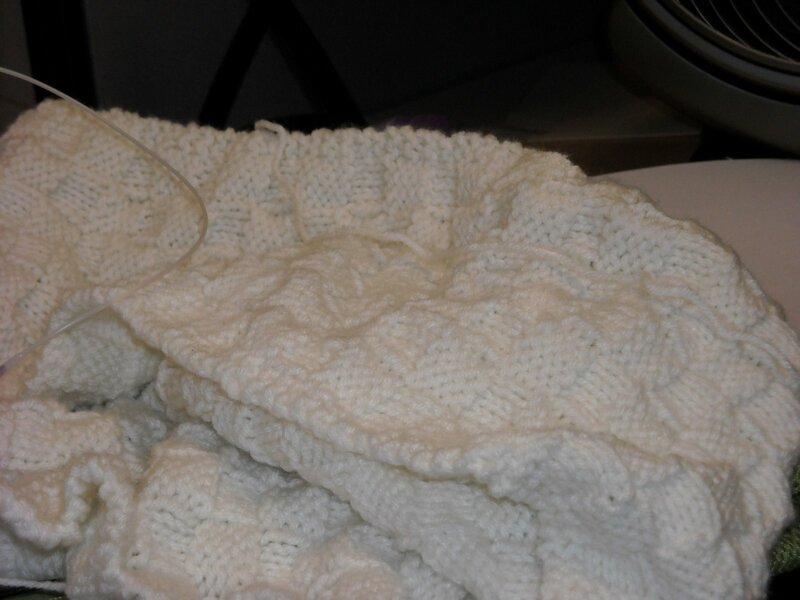 Here’s a WIP photo for you…I’ve already made one of these in green for one of my grandmas. The green was made with size 10 straight needles, and the yarn was Caron Wintuk. This one is in Wintuk as well, but I used size 8 circulars (I do better knitting on circulars, even knitting flat, because the needles are shorter and I don’t feel like I’m getting the yarn caught on it so often). I made a little more progress on the sweater, but I still haven’t split for the armholes yet. Our knitting group is focusing on baby items this month, and I’ve got two friends right now who are expecting, so I’d better get on the stick. This morning was freaking cold. As a result, I wore my super-spiffy warm socks over my regular socks. My feet were toasty warm all day! !